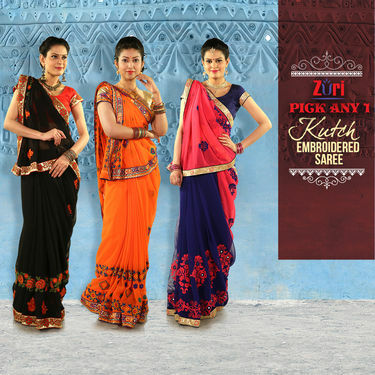 Look absolutely stunning with Pick Any One Kutch Embroidered Saree by Zuri, a handy collection for all social gatherings. Exclusively crafted from shimmer net fabric, they are easy to drape and comfortable to wear for long hours. Attractive colours and enhanced with paisley and circular motif designs, the collection caters both traditional and trendy look. Each saree comes with matching blouse piece and & raw silk petticoat to enhance your overall appearance. When it comes to buying a saree for weddings or other special occasions, considering Art Silk saree is the best choice to pick. However, buying a silk saree on an occasion every time may burn a hole in your pocket. Keeping everything in mind, we reviewed Pick Any One Kutch Embroidered Saree by Zuri which is apt for grand occasions. Material: Crafted from Georgette, the fabric is of finest quality providing maximum comfort to the wearer. Moreover, they are porous, delicate and light weight in nature that gives you weightless feel when worn for long hours. Designs/Prints: The rich looking designs are scantily spread on the sarees so as to give saree a beautiful and elegant look. We would highly recommend to buy Pick Any One Kutch Embroidered Saree by Zuri that will make you look vivacious be it wedding, family functions or evening parties. The combo is totally worth the purchase. I would highly recommend you to buy this saree at this price. Gifted this to my sister on here wedding anniversary.. She really loved it. Pick Any One Kutch Embroidered Sa..VSKanjeevaram Art Silk Saree - Pick.. Pick Any One Kutch Embroidered Sa.. VS Kanjeevaram Art Silk Saree - Pick.. Pick Any One Kutch Embroidered Sa..VSPack of 4 Designer Sarees by Zuri.. Pick Any One Kutch Embroidered Sa.. VS Pack of 4 Designer Sarees by Zuri.. Pick Any One Kutch Embroidered Sa..VSPick Any One Kanjeevaram Silk Sar.. Pick Any One Kutch Embroidered Sa.. VS Pick Any One Kanjeevaram Silk Sar.. Pick Any One Kutch Embroidered Sa..VSDeepika Collection of 3 Printed G.. Pick Any One Kutch Embroidered Sa.. VS Deepika Collection of 3 Printed G.. Pick Any One Kutch Embroidered Sa..VSPack of 3 Satin Stripe Sarees by .. Pick Any One Kutch Embroidered Sa.. VS Pack of 3 Satin Stripe Sarees by .. Pick Any One Kutch Embroidered Sa..VSPick Any One Georgette Saree with.. Pick Any One Kutch Embroidered Sa.. VS Pick Any One Georgette Saree with.. Pick Any One Kutch Embroidered Sa..VSPack of 9 Assorted Printed George.. Pick Any One Kutch Embroidered Sa.. VS Pack of 9 Assorted Printed George.. Pick Any One Kutch Embroidered Sa..VSSoumya Collection of 9 Georgette .. Pick Any One Kutch Embroidered Sa.. VS Soumya Collection of 9 Georgette ..